While the focus is firmly fixed on the London Olympics, BikeNZ has begun development for the Olympic Games in 2016 and two of Cycling Southland's number are among them. An eight-strong team has been named in partnership with Pure Black Racing to compete on the roads of Europe, with the aim of the group forming a nucleus working towards the Rio Olympics on both the track and road. It forms a major part of new partnership for BikeNZ, Pure Black Racing and Avanti who joined forces to create an international road racing development programme. The BikeNZ track endurance riders included in the group are Cycling Southland's Cameron Karwowski and Pieter Bulling and Scott Creighton (Hamilton). Christchurch rider Alex Frame, currently involved in the preparation camp for next month’s world championships, will join the group later. The squad includes two members of the Pure Black Racing development programme in Aucklanders Dion Smith and Taylor Gunman, who rode for the team last year. BikeNZ will tap into some of the kiwi talent on professional contracts for the Under-23 Nations Cup campaign in the Netherlands and Belgium next month, as well as high ranking UCI races in Germany and Ireland. Dependant on availability from their professional teams and on the specific needs at each race, riders including Patrick Bevin (Taupo), PowerNet Tour of Southland winner Josh Atkins (Christchurch) and national under-23 champion Michael Vink (Christchurch) have indicated their interest. The squad will also compete on the track, road and criterium circuit in the United States for sixth weeks in June and July. “Certainly our High Performance focus is on London but at the same time we have to begin our next cycle towards Rio,” said BikeNZ High Performance Director, Mark Elliott. “We know from experience that high quality road racing in Europe is a vital part of the development for our track programme. “Over the past three years we have built up some excellent contacts in Europe and have secured some excellent race starts against the best under-23 riders in the world. That’s the sort of tough racing we need. “This year we are also delighted to be able to add two of our exciting young road riders in Michael Vink and Patrick Bevin to bolster the campaign for the Nations Cup. “The overall campaign is also a further opportunity to extend the partnership with Pure Black Racing and incorporate two of the team’s up-and-coming young riders. The team have excellent credentials. 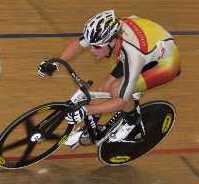 Creighton won a bronze medal at last year junior world track championships with Frame picking up two medals, while Bulling had two fourth placings the previous year. Karwowski was a former world junior team sprint gold medallist and made his UCI World Cup debut in the team pursuit in Beijing earlier this year. Gunman and Smith are both junior internationals who made their debuts for Pure Black Racing last year. Gunman is a former podium finisher in the UCI Junior Nations Cup at the Tour de l'Abitibi in Canada before stepping up to the PBR team last year. Smith, a Massey High School cycling graduate, also impressed at the Tour de l'Abitibi and was the leading New Zealander in the under-19 road race at the world championships in Copenhagen last year. Their first race in the Nations Cup featuring the world’s best under-23 riders is the Tour of Flanders starting on April 7. The European schedule is: April 7: UCI Nations Cup – Tour of Flanders,April 11 UCI Nations Cup – La Cote Picardie, April 14: UCI Nations Cup – ZLM, May 1: UCI 2.1 - Rund um den Finanzplatz Eschborn-Frankfurt, May 20 – 27: UCI 2.2 – An Post RAS, Ireland.